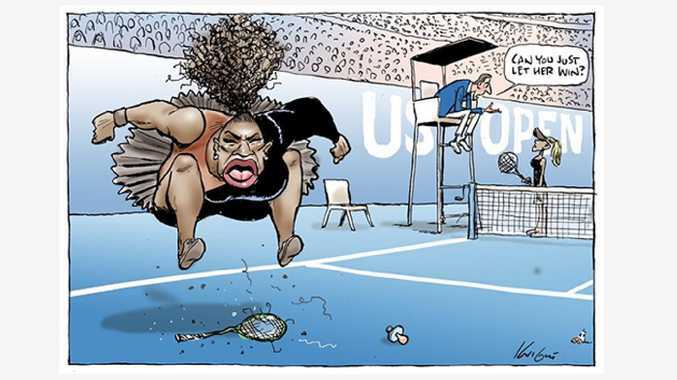 Mark Knight's impression of Serena Williams' temper tantrum at the US Open. 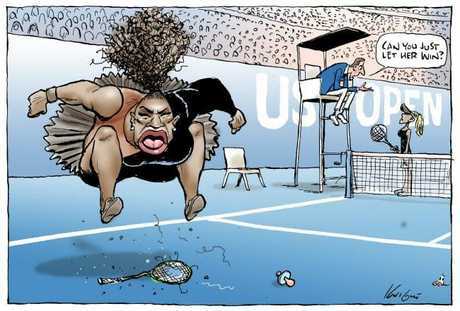 HERALD Sun cartoonist Mark Knight says he suspended his Twitter account overnight because of abuse towards his family over his cartoon of Serena Williams' US Open tantrum. Australia's finest cartoonist said while positive comments were outweighing negative, he chose to do it to stop family being abused. The Herald Sun's veteran cartoonist says his portrayal was never about race or gender - rather the sporting superstar's bad behaviour. Knight's take on Williams' blow up showed the 23 Grand Slam winner spitting the dummy and stomping on her tennis racquet as the chair umpire told US Open champion Naomi Osaka in the background: "Can you just let her win." Knight said he was "amazed" at the reaction to his cartoon, depicting Serena spitting the dummy and stamping on her tennis racquet as the chair umpire told US Open champion Naomi Osaka in the background: "Can you just let her win." "I drew this cartoon Sunday night after seeing the US Open final, and seeing the world's best tennis player have a tantrum and thought that was interesting," he said. "It's been picked up by social media in the US and my phone has just melted down. "The world has just gone crazy." "I tried to reply to these people but they just don't listen," he said. "On any given day you are a hero and on any given day you are a pariah. "And you just have to live with it." 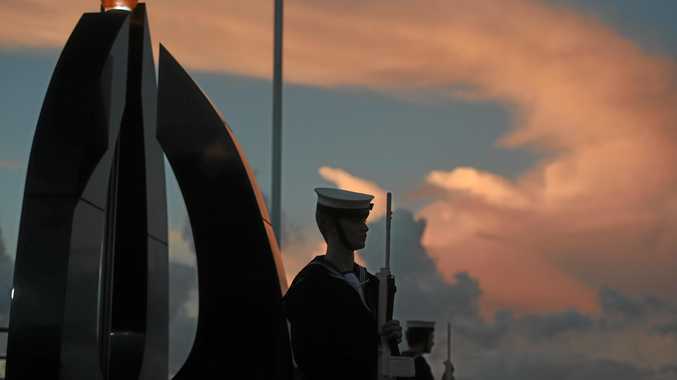 "This shows an awful misunderstanding of Mark Knight and this country," he said. "I looked at that cartoon and it didn't even cross my mind it was about race. "It was a sports bully, a petulant child throwing a tantrum about losing." "She behaved badly, she probably knows it," he said. "He's sending Serena up, not because she's black, but because she was acting like a bully and a child. 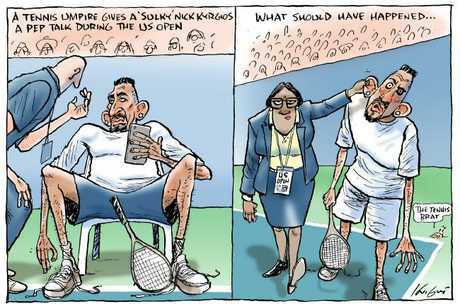 This cartoon in the Sunday Herald Sun depicting Nick Kyrgios received no criticism or accusations levelled about race or gender. Knight cartoon on Harvey Weinstein. 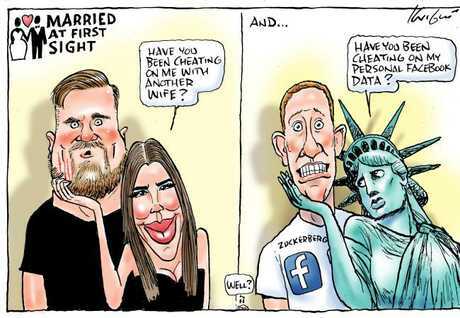 Mark Knight cartoon on Facebook data mining. 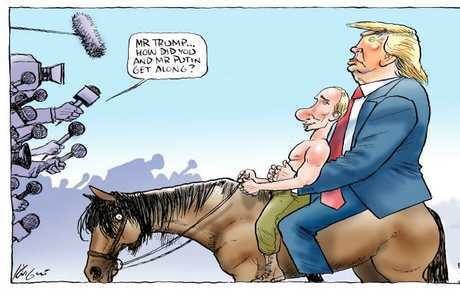 Mark Knight cartoon on Trump and Putin.